Shoppers at the Costco store in the town of Hawai'i Kai in East Honolulu might be surprised to learn that there's an environmental and cultural treasure nearby. 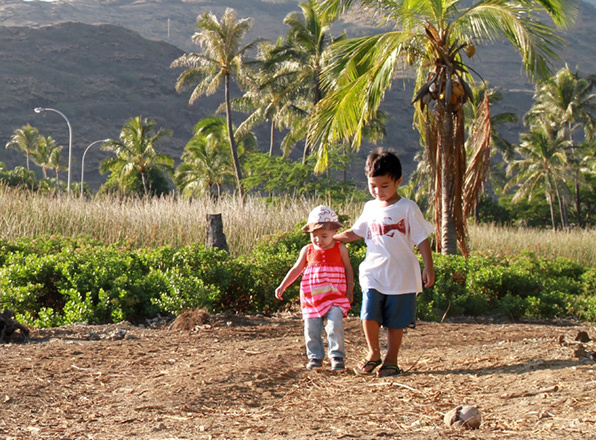 The Hāwea heiau complex reflects the land's cultural history in its ancient walls and petroglyphs, agricultural terraces, niu (coconut) grove, and heiau (places of worship). The adjoining Keawawa wetland, originally used for fishing and farming, provides a home for native wildlife such as the endangered 'alae 'ula (Hawaiian moorhen) and other bird and insect species. When developers proposed building luxury condominium amenities on this special site, local community nonprofit Livable Hawai'i Kai Hui asked The Trust for Public Land for help. We purchased and transferred the property to Livable Hawai'i Kai Hui, which will continue to use the land to celebrate and perpetuate traditional Hawaiian cultural practices. This wonderful project was made possible through the support of many, in particular Livable Hawai'i Kai Hui's Board and volunteers; Governor Neil Abercrombie; Mayor Kirk Caldwell; Stanley Chang; Laura Thielen; Gene Ward; William Aila; Molly Schmidt; Ian Hirokawa; Ember Shin; Ed Sniffen; Krishna Jayaram; Don Aweau; Honolulu's Clean Water and Natural Lands Commission; Hawai'i's Legacy Land Conservation Commission; Hale Ka Lae and Hanwha; Christine Camp and the Avalon Group; Michael Greco; with funding from: The City and County of Honolulu's Clean Water and Natural Lands Program, and the State of Hawai'i's Legacy Land Conservation Program and many generous donors to The Trust for Public Land.